4:44 AM high 8.7 ft.
10:44 AM low 0.3 ft.
5:49 PM high 8.0 ft.
10:53 PM low 3.2 ft.
How to reach: To reach the tidal bench marks, from Seattle depart on the Winslow Ferry and take Highway 305 north to Highway 3 towards the Hood Canal Bridge. From the west side of the Hood Canal Bridge travel west on Route 104 to the Port Townsend/Chimacum turn-off onto County Road 12. Drive 23 km (14 mi) to Route 20 and turn right. Then go 6 km (4 mi) on Route 20 into Port Townsend. Continue on Water Street (Route 20) to the Washington State Ferries Dock on the right. The bench marks are located along Water Street (Route 20) towards Point Hudson. 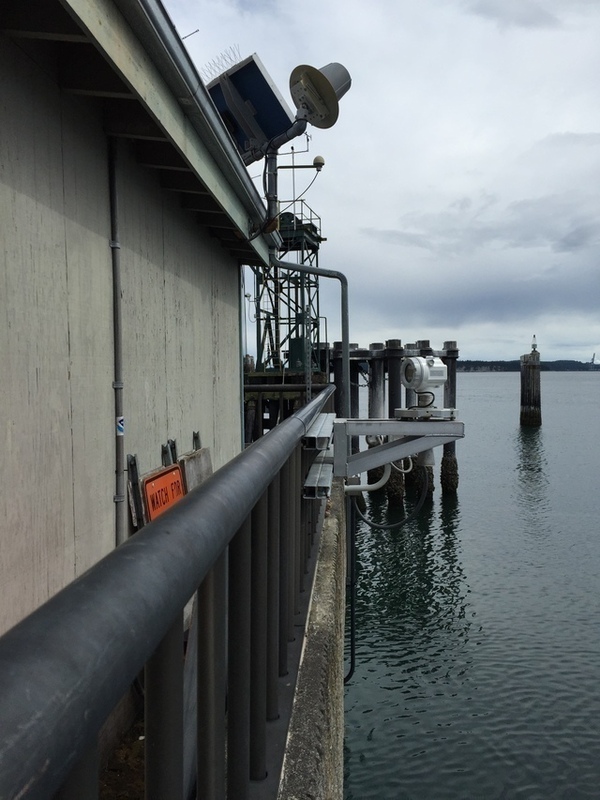 The tide gauge is located in the middle of three rooms in a wooden storage garage at the SW corner of the dock.